If you want to grow your business and build brand awareness, you may be considering truck or van wraps as a way to get your message across. Vehicle wraps are the most cost-effective way to generate tens of thousands of customer impressions daily. At Sunrise Signs, our in-house experts help you execute your vision. We take a consultative approach, which allows us to deeply understand your business goals and bring stellar truck, trailer or van wrap design ideas to life. 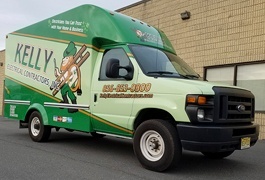 Sometimes, home services and B2B businesses hesitate to implement van and truck wraps because they can’t afford to have their vehicles off the road. After all, downtime directly hits your budget. We understand your need for a quick turnaround. That’s why we expedite the wrapping process so you get your vehicles back quickly, usually within a matter of days. Whether you’re hauling, delivering or simply driving, van, truck and trailer wraps are an effective way to make your business more visible. The available space on your vehicles is ideal for connecting with new leads and clients. The American Trucking Association (ATA) found that 91% of people surveyed notice vehicle graphics. A study by the Trafﬁc Audit Bureau for Media Measurement showed that a vehicle can generate between 30,000 to 70,000 impressions daily. 3M calculated that a company would need to spend $130,000 in advertising dollars to produce the same effects of a $3,500 vehicle wrap. Studies show that vehicle graphics improve name recognition by more than 15 times. Vans, trucks and trailers come in many shapes and sizes. Vans may have a standard wheelbase or extended wheelbase, and a standard roof, high roof or jumbo roof. It’s important that your design is tailored to your vehicle type. Your wrap provider must also take cab type into account when wrapping your truck. Truck wrap designs will be different for a single cab, double cab, quad cab or crew cab. Some trucks may also have utility bodies, which offer convenient real estate for your messaging. Our truck, trailer and van wraps are made of large-format graphics printed onto high-quality pieces of adhesive vinyl. Since a professional from our team installs them, your wrap application will be consistent across your entire fleet. With proper care, a wrap lasts for about ﬁve years. Removal is easy when the time comes. Plus, our wraps will not damage your existing paint job. Whether you’re wrapping a minivan or a pickup truck, you have a variety of choices for your wrap’s look. We’ll help you choose an ideal option suited to your budget and business goals. A full wrap covers your entire van, truck or trailer in vinyl. Typically, a full wrap features a pattern or color along with large graphics or photo-realistic images. Full wraps are ideal when your design is heavy on graphics. If you only have a few graphics and you want to save on the cost of materials, a partial wrap is another great option. Usually, a partial wrap covers only the sides or back of your vehicle. Partial wraps help you bring focus to one or two design elements, such as your logo or a list of services. We’ll be with you every step of the way during your engagement with us. From conceptualization to design, fabrication, project management, installation and maintenance, we’ll answer all of your questions and ensure you get the most value out of your wrap. Our Philadelphia location is convenient to businesses in New Jersey, Delaware and southeastern Pennsylvania. However, our national network of installation experts can install our vehicle wrap designs anywhere in the country. When you’re ready to learn more about how our wraps help you revitalize your brand, download our free information kit.